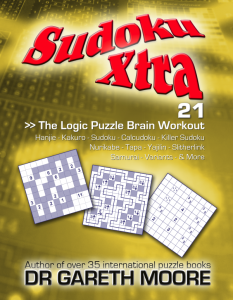 Sudoku Xtra 21 is packed full of 144 top-quality logic puzzles covering a wide range of types. There is a particular emphasis on Sudoku and new varieties appearing for the first time in this volume include Quad-Max Sudoku, Anti-Knight Sudoku, Slashed Sudoku, Minus Little Killer, Product Frame Sudoku, Headless Worm Sudoku, Extra Region Windmill Sudoku, Non-Consecutive Diagonal Sudoku, Mystery Calcudoku Zero and a giant Trio 13-grid Samurai Sudoku. The very first page features a large Arrow Samurai Sudoku, and other returning variants that were recently introduced to the series include Worm Sudoku, Quad Clue Sudoku, Offset Sudoku, Sudoku XV and Kropki Sudoku. Not only that, but there’s Hanjie, Futoshiki, Hashi, Yajilin, Calcudoku, Dominoes, Hitori, Slitherlink and many more logic puzzles. Pre-printed copies are on top-quality, 8.5×11 inch paper ideal for solving on, while download PDFs are designed to fit both A4 and Letter paper for printing. This entry was posted by Gareth Moore on October 29, 2012, and is filed under Sudoku Xtra, magazines. Follow any responses to this post through RSS 2.0. You can leave a response or trackback from your own site.